To put it simple, it is far more easier to submit an application in Android play store rather than approaching Apple store for the same. For the former, the guidelines are simple and that’s why it gets easier to register the application. As submitting apps for Android is easier, the aesthetics of the store has got affected a bit. On the other hand, Apple store looks more promising and refined. Because of an easier app submitting procedure, the Google Play Store is getting cluttered. And, it is obvious. When you allow an easy process to register the apps, what more you can expect? It is not that Google Play Store has lost all its aesthetics, but it is high time we must consider maintaining the beauty of the store in order to entice more and more users towards apps. 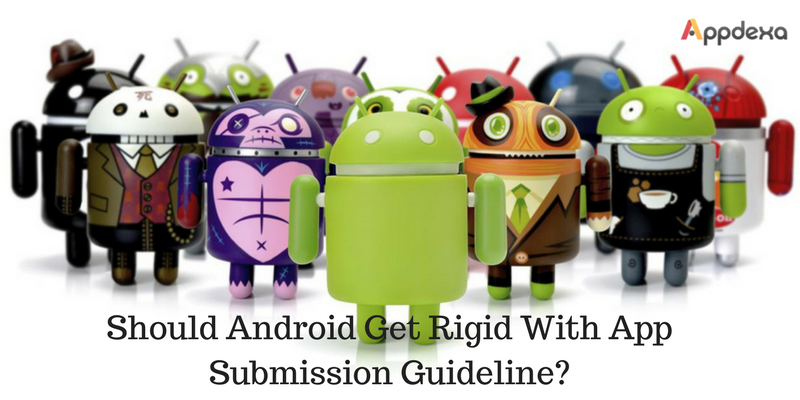 The article is going to ignite the discussion on “should Android marketplace become more rigid with its app submission guidelines”. It is important that Google allows submission of only those apps that maintain their aesthetics. Poor looking apps should never be allowed to even make their registration in any of the app stores. It creates an impact on the overall app store aesthetics and also over the minds of the users. When there are a few hurdles to pass from, the race gets easier. Same goes for submitting applications at Google Play Store. It allows an easy app submission as a result of which a number of apps, irrespective of their poor feel and look are there in the store. On the other hand, having some strict rules ensure that only genuine and good-looking apps can make their entry at the store, which is fair enough from every point of view. The huge freedom that Google Play Store has given to developers for submitting the applications has created problems as we have discussed earlier. To get around this problem, it is important for Google to strictly check the apps that are submitted in the store or should develop guidelines that create a strict path for app submission. It is sure to add hurdles to the submission of apps that are not at all genuine. Why reality check is important? In order to maintain the sheer charm of Android App Store, it is more than important to work on a plan that check the submission of the apps. Letting a poor-quality app enter in the store will only damage the image the App Store has gained till date. And, it is of course not in the favour of the Google Play Store. A rigid step from Google can help in making the app store much better in terms of overall aesthetics. And, this element matters as users are sure to get enticed with the overall looks. Thus, to attract more and more users to the store, this particular element can play an important role.